Boreal Chickadees are larger than most other chickadee species. Only the Chestnut-backed Chickadee is of similar size; both species are about 5.5 inches in length. Boreal Chickadees weigh about 10 grams. Both sexes of the species are similar in appearance; they are brownish overall, with a brown cap and back and rufous flanks. The face is white but the side of the neck has more gray, making a distinct two-color look to the face. The tail and wings of the Boreal Chickadee are both plain gray. 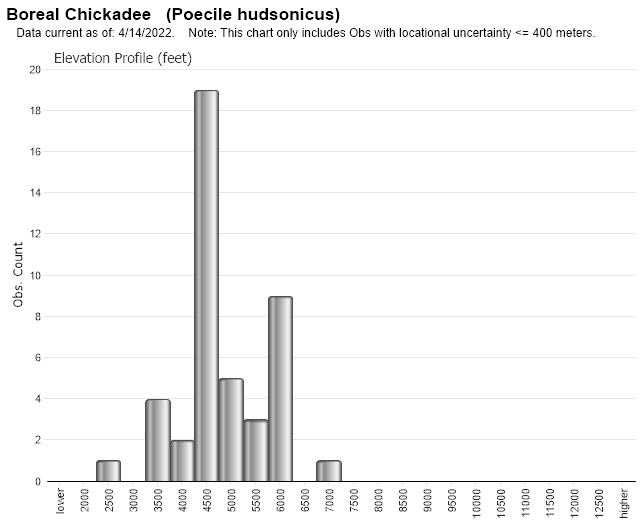 Juvenile Boreal Chickadees are similar to adults but duller and paler overall (Ficken et al. 1996). The Boreal Chickadee is distinguished from the Black-capped Chickadee (P. altricapilla) by having plain gray wings and tail instead of having bold white edges on the wings and tail as does the Black-capped Chickadee. The nape of the Black-capped Chickadee is mostly white instead of the gray of the Boreal Chickadee. Also, the flanks of the Boreal Chickadee are rustier in color compared to the buffy, washed-out color on the flanks of the Black-capped Chickadee. The Mountain Chickadee (P. gambeli) has no rusty coloration and has a white streak (supercillium) above the eye that is diagnostic. The Chestnut-backed Chickadee has a deep chestnut colored back and flanks and is easily distinguishable from the Boreal Chickadee (Sibley 2014). Montana is in the southern extreme of the Boreal Chickadee's breeding range. 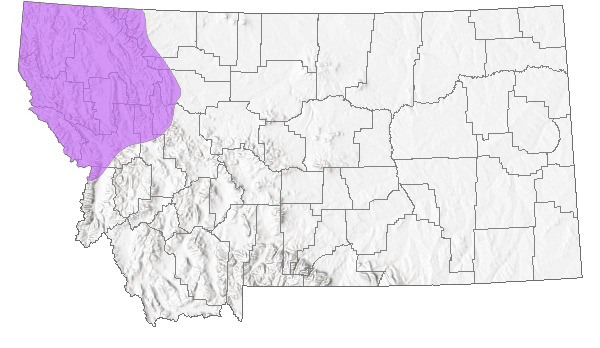 Any southward migration of this species ends in northwestern Montana. The species has been observed in migration as early as June, but the majority of observations have occurred in August and September. They have been observed moving into Montana as late as November (Montana Bird Distribution Committee 2012). 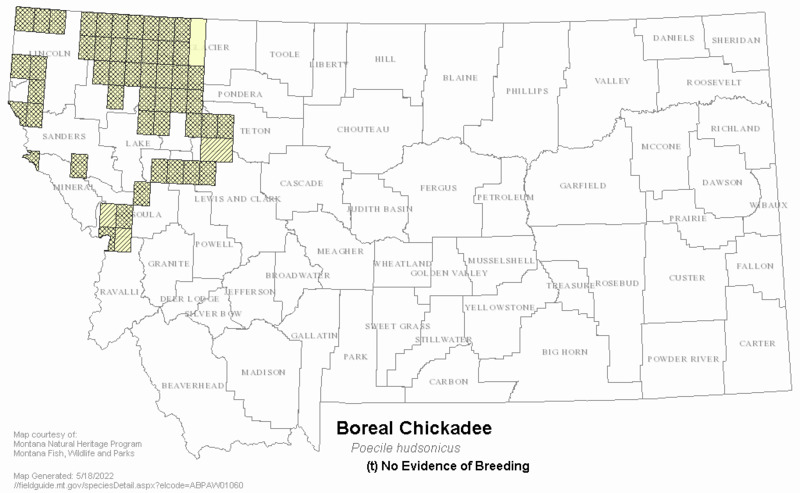 No information regarding Boreal Chickadee habitat specific to Montana exists. 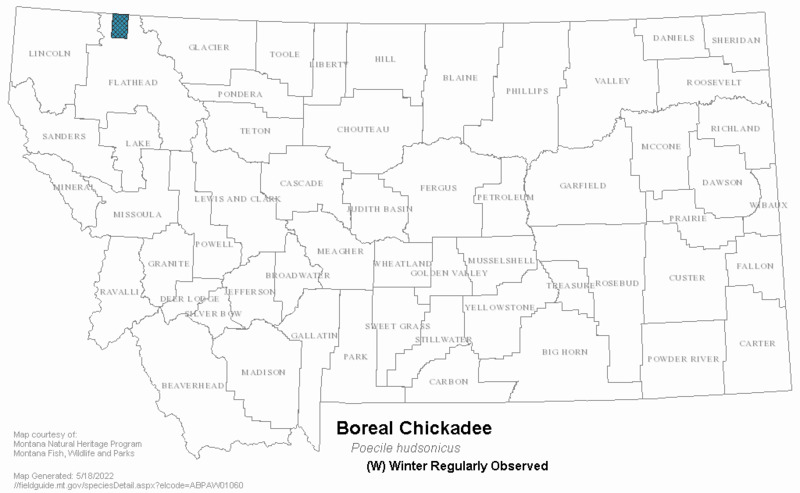 However, information from other regions where Boreal Chickadees occur indicates the habitat is boreal coniferous and mixed forests, muskeg bogs, in the vicinity of white cedar and hemlock swamps, birches and streamside willows. The species nests in natural cavities or abandoned woodpecker holes, or in a cavity dug by a pair in a rotten tree stub, usually within 1 meter of the ground (but up to 3.7 m). The Boreal Chickadee eats conifer and birch seeds, and the eggs, larval stages, and adults of insects. It forages mainly on twigs and branches of trees (Terres 1980). Territorial during the breeding season, but flocks the remainder of the year (Ficken et al. 1996). 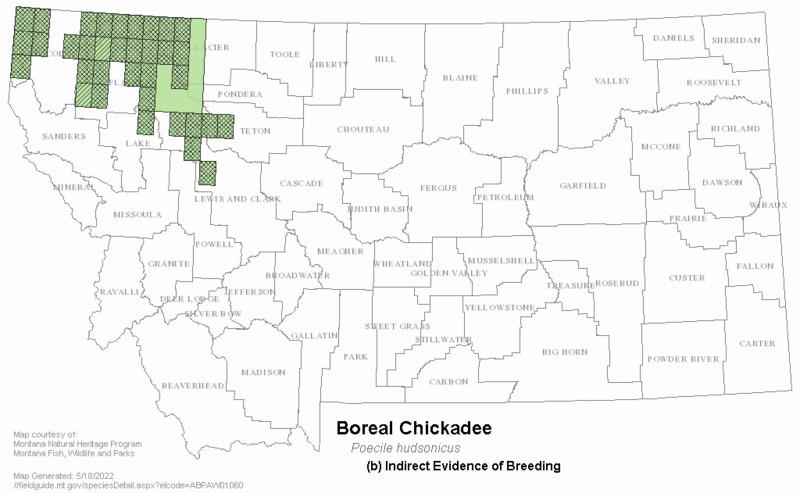 Little information exists regarding Boreal Chickadee reproduction in Montana. No systematic surveys have been done in the state. Also, Boreal Chickadee breeding habitat is located where surveys would be difficult due to inaccessibility and terrain. Only three known breeding records exist for the Boreal Chickadee in the state and all of them occurred between 1980 and 1985 (Montana Bird Distribution Committee 2012). Based upon general information available for the species, the clutch size is 4 to 9 (usually 6 to 7). The female incubates 11 to 16 days. Young are tended by both parents and usually leave the nest at 18 days. 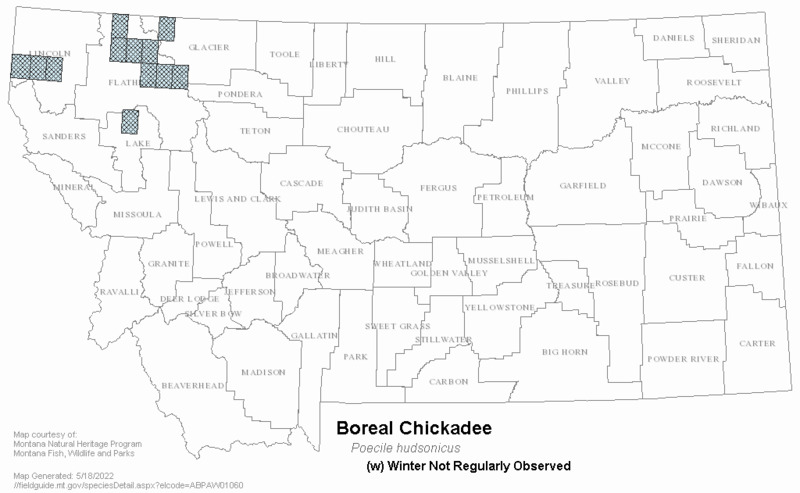 No known active management is ongoing for Boreal Chickadees in the state. American Ornithologists’ Union [AOU]. 2000. Forty-second supplement to the American Ornithologists’ Union Check-list of North American birds. Auk 117:847-858. Dixon, K.L. 1961. Habitat distribution and niche relationships in North American species of Parus. Pages 179-216 in W. F. Blair, ed. Vertebrate Speciation. Univ. Texas Press, Austin. Farr, Daniel. 1993. Birds of the boreal forest. Pages 55-62 in Proc. of a workshop held March 10-12 in Prince Albert, Saskatchewan. Jewett, S.G., W.P. Taylor, W.T. Shaw, and J.W. Aldrich. 1953. Birds of Washington state. Univ. Washington Press, Seattle. 767 pp. McLaren, M.A. 1975. Breeding biology of the boreal chickadee. Wilson Bull. 87: 344-354. Saunders, A. A. 1914. The birds of Teton and northern Lewis and Clark counties, Montana. Condor 16:124-144. 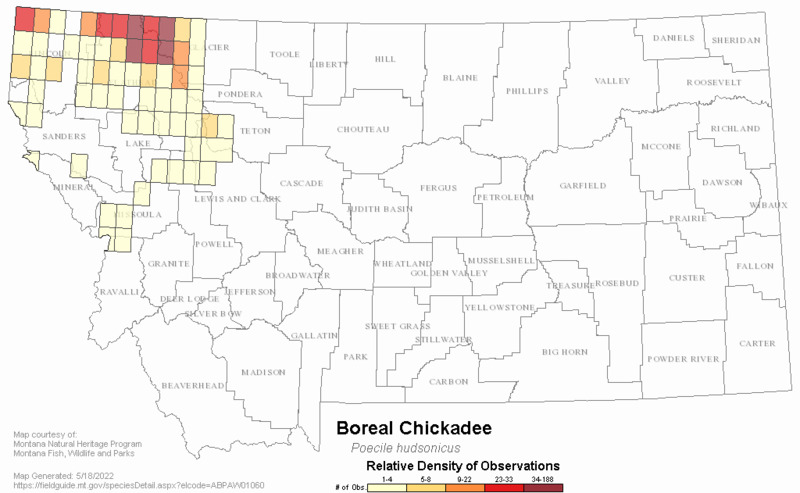 Web Search Engines for Articles on "Boreal Chickadee"